It is such an unusual sight to see these stunning, graceful creatures walking around on the serene ranch. Giraffes range in height from 14-19 feet. Giraffes have seven vertebrae, just like humans. They can fully extend their heads to reach the leaves on the tallest trees. One way to differentiate males from females in the wild is by the ossicones (horns) on top of their head. Females will have tufts of fur on the ossicones, while males do not, because they keep it worn off while fighting for dominance with other male giraffes. Their beautiful markings are like finger prints and no two are alike. However, researchers have found that giraffes in the same area will have similar markings. Giraffes don’t like to be pet, but they do like to be fed. Hold onto the branch tightly or they will pull it right out of your hands. The ranch is home to several species of camels, including Dromedary (1 hump), Bactrian (2 hump) and Tuli, which is a hybrid (a cross between a Bactrian and a Dromedary). The camels were the greatest surprise. When you think of camels, you may think of biting, spitting creatures with an attitude. Camels don’t spit at all, but they may regurgitate on you if they are angry (kind of good news, bad news bit of information.) The camels at Giraffe Ranch are so friendly, more dog-like than camel-like as they run up to greet you. They enjoy a good back scratching. 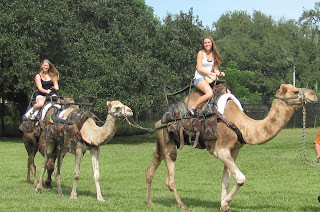 Guests can pay an additional fee to ride the camels. Dufus is one of the largest camels, so he usually gets picked last by hesitant riders. We had the opportunity to meet another camel named Forest Hump. He spotted the safari vehicle and ran up to greet us. I had been distracted looking at the ostriches, when he gently nudged my back, as if to say “hey, pet me!” We each took a turn petting the gentle giant. Giraffe Ranch was years in the making before it opened to the public in 2008. The ranch is not only home to giraffes, but a variety of exotic and domestic animals including rhinoceros, zebras, ostriches, tortoises and so much more. When you arrive at the ranch, a feeling of peace, happiness and harmony with nature surround you on the 47 acre ranch. The rolling hills and grass lands of Dade City are the perfect environment for the animals. Large oak trees provide the much needed shade for the animals and visitors on the ranch. Lex Salisbury and his wife Elena Sheppa own Giraffe Ranch. Salisbury has devoted his life to the care of animals. His love of creatures big and small has led him to create a ranch where the animals have ample room to roam. In addition to getting his Master degree in Environmental Science, he worked at zoos in Australia, the United Kingdom, spent 21 years at the Lowry Park Zoo, and went on many safaris in Africa, which increased his knowledge and led him to his own ranch. Education is an important part of Giraffe Ranch. If we want to continue to enjoy these beautiful creatures, we need to know how to live in harmony with them and help them thrive to avoid extinction. As you embark on the tour, you will learn interesting information about the animals on the ranch, Each area is gated to keep the animals safe. In the small animals section you will see a variety of animals including monkeys, lemurs, porcupines, tortoises, and even guinea pigs. As you hear little known facts about these creatures, you may catch a glimpse of the long legged giraffe peering above the trees in the adjacent gated area. From the causeway at Howard Park you can see Sunset Beach. Whether you want to sit under a shady palm tree and read a good book or wade in the shallow warm gulf, Sunset Beach is the place for you. Photographers will love the unobstructed view of the sunset as it melts into the horizon. Picnic tables, bicycle racks, boat ramps and facilities are available. 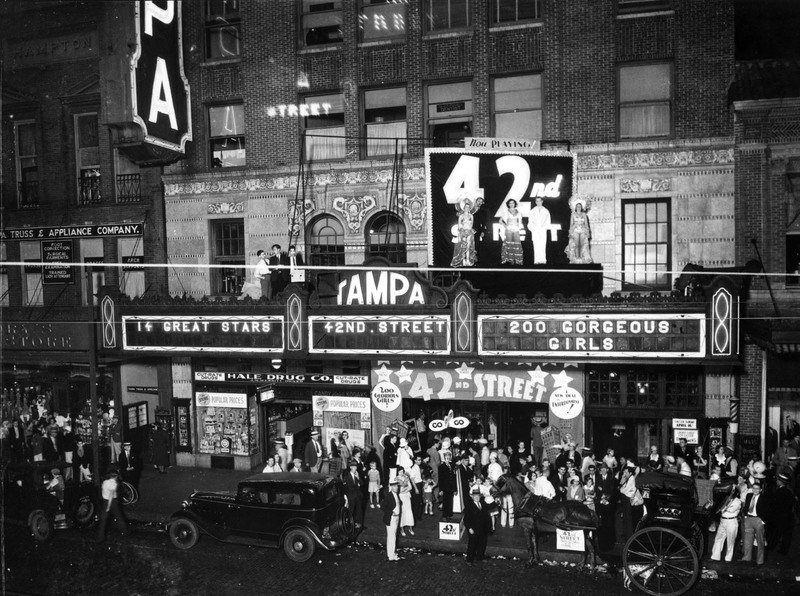 Concerts are held on the first Thursday of each month at 7 pm. Just North of Honeymoon Island is Fred Howard Park, named for the former mayor of Tarpon Springs who was elected into office in 1945. Howard was a successful real estate businessman with a passion for the community. He was Commissioner and Vice Chairman of the Pinellas County Park Board for more than 30 years. The 155-acre park first opened in 1966. Howard worked to secure the property for Tarpon Springs residents and people from the surrounding area, to enjoy. A bronze plaque has been placed at the bottom of the flagpole in his honor. The park has playgrounds and picnic tables in well shaded areas. Along the open causeway you will find people fishing and jet skiing. The causeway then leads to the sandy beach area. Palm trees provide some much needed shade and the gradual slope of the sand into the water make this an ideal place for families with young children. From March through September, lifeguards are on duty from 9:00 am to 5:00 pm. Automated pay stations have been installed with a fee of $5 per day. Annual parking passes can be purchased for $75 ($55 for people 65 or older). Join The Florida Orchestra for a free Pops in the Park concert Sunday, May 12, at 7:30 p.m. at River Tower Park in Tampa. Guest Speaker Julie Ann Howell of Peppertree Publishing. She will discuss publishing in her talk entitled "From Manuscript to Masterpiece". 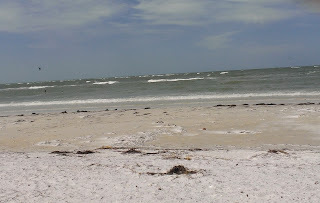 Honeymoon Island has gone through many names over the years since it was first visited by the Tocobaga tribe, who lived in the Tampa Bay area from the 900s into the 1500s. The Indians were known to eat large amounts of shell fish, and this may be one of the reasons they traveled to the island. Spanish explorers, pirates and traders also visited the barrier island. Over the next few centuries the island 's name changed from Sand Island to Hog Island in 1880. In 1921, a hurricane split the island creating Caladesi Island and Hurricane Pass. A New York developer, Clinton Washburn, had a vision for the pristine beach area and named it Honeymoon Island. In 1939, he built 50 palm-thatched bungalows for honeymooners. The beautiful Florida weather and white sandy beaches made it a perfect destination point for the brides and grooms. When the war started and factories were producing goods around the clock, it became a place to relax and unwind for tired workers. In the 1950s, Honeymoon Island was sold to Arthur Vining Davis, then Hyman Green, and eventually the state bought it in the 1970s. 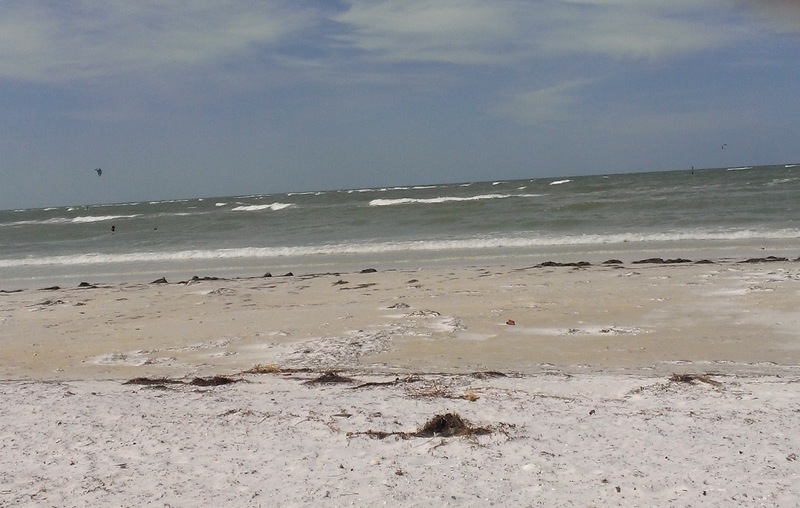 Honeymoon Island is still enjoyed by visitors today. Whether you want to stay on dry land or enjoy the crystal clear water, you can rent bikes, kayaks, umbrellas and even beach chairs at Café Honeymoon. Dog lovers can bring their four legged friends to the dog park, so they can play in the warm Gulf waters. A ferry from Honeymoon Island can take you to Caladesi Island, a 600-acre oasis that is only accessible by boat. Three miles of beaches and a meandering nature trail make this a nature lovers paradise. Bring a picnic lunch or enjoy eating at Café Caladesi. Restrooms and showers are available for beach goers. As you walk along the nature trail, you may see a gopher tortoise, osprey, eagles, egrets or maybe even an armadillo. Walk along the shell laden beach or sit on one of the many commemorative benches and enjoy all that nature has to offer. 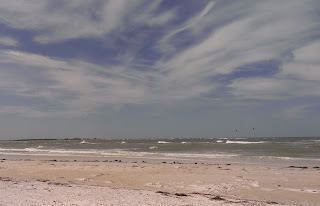 For more information, go to http://www.floridastateparks.org/honeymoonisland/.